Beaducation: The Blog: New Shapes for Summer! You've probably noticed all the geometric shapes showing up in fashion these days. Patterns of triangles, squares, chevrons and teardrops are coming at us from everywhere! We have been adding to our collection of Design Stamps with many new Geometric Shapes for your patterning pleasure. 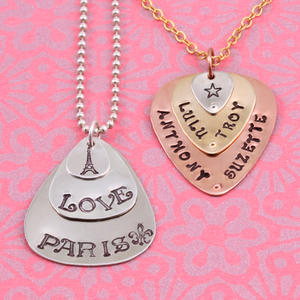 We have also added some new blanks to spice up your summer designs! Folks have loved our triangle blanks for quite awhile and we realized it was time to add in some rounded squares. Everyone loves to layer all our different sizes of circles, so why not mix it up with a layered Rounded Square Pendant! 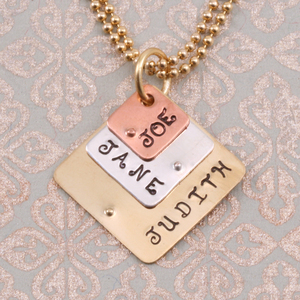 We think it is a fresh take on the layered circle stamped name pendants. Our most popular shape, other than circles has to be our Guitar Pick. When we realized we could get these puppies in different sizes we wanted to be the first to get a jump on layering them! The best thing about layering the guitar pick blanks is that you can stamp them either wide-side-down or wide-side-up as you see in our sample. We think they look pretty cool! What do you think? If you like these additions to our blanks, be sure to check out our new smaller puzzle pieces as well as our arrow blanks. What other blank shapes would you like to see us add to our selection? My first pliers were from the craft store. I haven't invested in a good quality set yet!